Before you can read charts for trading, you need to create them. Creating a stock chart involves picking many variables. To create charts, you set numerous chart attributes, overlays, and indicators. Periods: You can choose daily or weekly, depending on the time frame of your trading. Intraday charts are also available for day traders. Range: You can set the range as one, three, or six months; one, two, or three years; year-to-date; or a specific date range you choose. Type: You can use various types of bars, lines, dots, and others. Size: You can set the size as well as choose between portrait and landscape. Overlays: You can pick numerous types of overlays. The most commonly used are shown in this image: 50-day and 200-day moving average. Indicators: StockCharts allows you to use 42 indicators. Knowing which variable to use to produce a chart to meet your needs is a key part of technical analysis. So practice charting as you read about each technique. StockCharts.com provides an excellent chart school that goes into technical detail about each type of overlay and indicator it offers and what you can expect to determine by using them. 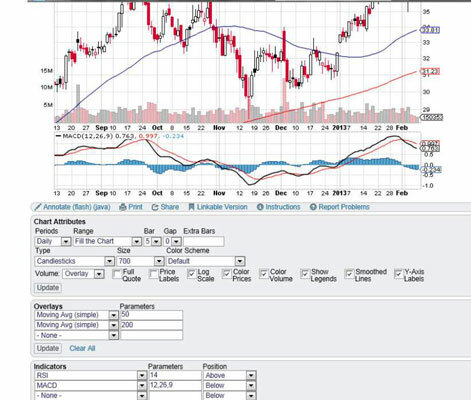 To explore the Chart School, go to StockCharts.com and click the tab labeled Chart School.